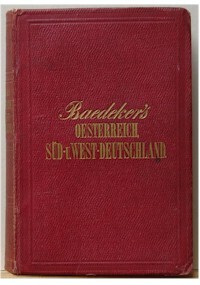 Baedeker editions covering Austria and Southern Germany in German. The Austrian editions are a bit confusing. First, Austria was covered in the early editions on Germany. Then, two separate series were broken out of the main German edition, one (to the left below) on Austria and Southern and Western Germany, and one (to the right below) on Austria only, later Austria-Hungary. In addition, of course, Southern Bavaria and the Tyrol had a series to their own. The corresponding English editions are called Southern Germany and/or Austria, while the area is covered in French by the French editions of Allemagne et Autriche or Allemagne du Sud.